Original plan was to npr intercooler the grey car because it's drop in and is a known good upgrade. 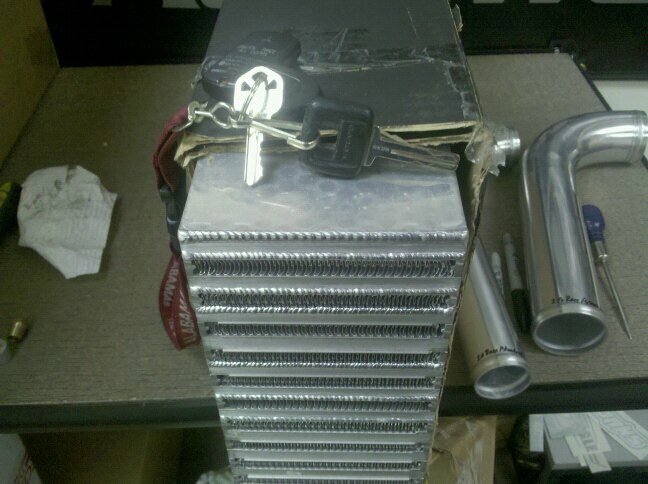 But what makes these cheap $100 eBay intercoolers different from a treadstone or factory npr intercooler? Labor cost to make them or are there actual structural difference that make the eBay ones so much cheaper? State sponsored Chinesium is always cheap. of course this is all relative to goals and needs. if you're not going to be making a lot of power, a la the average tbricker, the ebay stuff works fine. Ebay intercooler is considered a huge upgrade over stock, yes? Do88 is likely better than ebay, yes? I'm a bit confused about those pics Linuxman, respect due, but pretty sure the first pic isn't a brand new intercooler lol. Marvelous3, I'd go with the CX Racing route, for the price of an NPR you could get the piping and intercooler for the same price, all new stuff, and will support more than the power you are aiming at. If you're confused it's because you're lacking mental acuity. Of course it's not a new intercooler, new intercoolers don't have leaves in them either in case you missed that one as well. 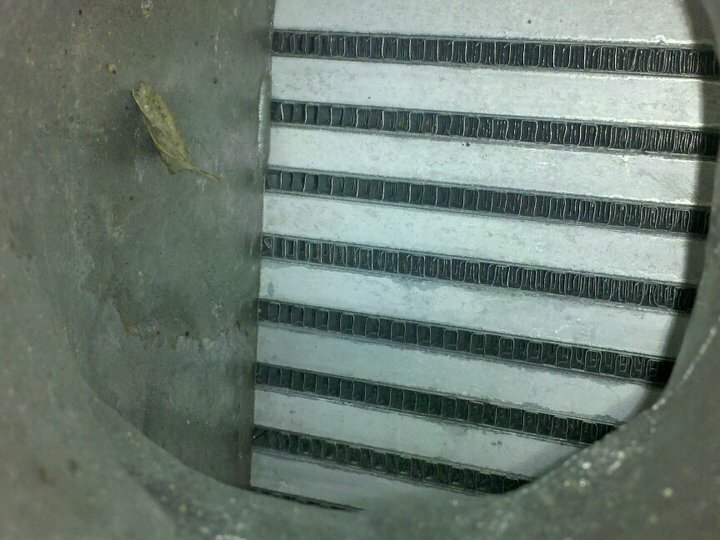 I don't recall stating the ebay intercooler was new, but age doesn't shrink the core. If you are not sure what you are looking at on the differences there you could stop and ask. for another point of reference (not that it matters to any of you guys), we swapped cores on one of those joe blow 12x3x18 "generic" ebay intercoolers on a turbo honda, and picked up around 100whp, same size garret core. 20% give or take on that car at that time. The anecdotal story about the Honda is not an uncommon story. I've read that stuff in a bunch of places and now seeing them side by side I can see why you get a 20% increase. And for what, $200 extra? Seems to be a no brainer. NPR core made for ambient IAT in the Hornetkar on the track. Do it. IAT's before and after? Manifold pressure unchanged? Ignition timing unchanged? 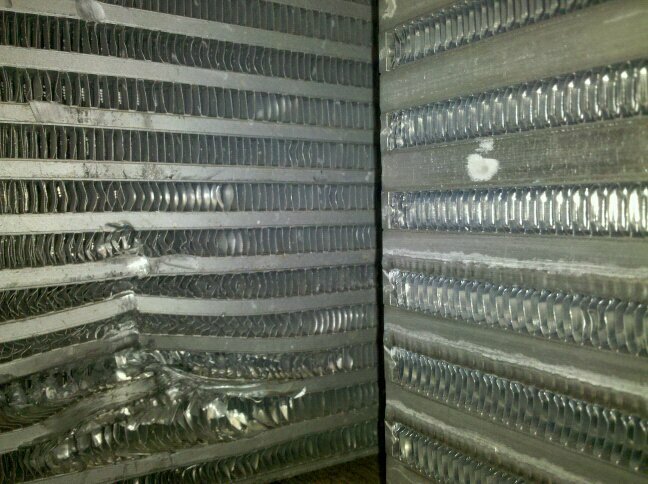 Why would you post a pic of an intercooler you crushed into something? How is that relevant? Why try to insult me when you posted an obviously seriously damaged part as a comparison? The CX racing intercooler is a great improvement over the stock intercooler. Can't really argue with that. If you don't understand the point of the pictures, you need go back to your play room, sit down, shut up, and color with your three old crayons. Stay inside the lines please. Ignore the goddamn dent, that had nothing to do with it. I don't have an axe to grind against cheap ebay intercoolers, I've already said as much. but if people want to know (because this seems to come up on occasion) "Why would you spend XXXX on that intercooler when there's this cheap $3 intercooler on ebay?!!" that * might* be a reason. I don't know... why would you buy a garrett turbo when there's $100 ebay turbos? PSI is PSI right? what does it matter? we swapped cores on one of those joe blow 12x3x18 "generic" ebay intercoolers on a turbo honda, and picked up around 100whp, same size garret core. I don't know that it would do any good. It was around 11 years ago, the car went from a well tuned ~500whp to an out of fuel pump 6xx whp on the first pull following the core swap (as in, cut the end tanks off and welded them to the new core, in case that wasn't obvious). They had to turn the boost down after the swap. So, you tell me, Why would anyone do that? !